Ahhhh, you know its coming, Spring! Its time to get things cleaned up and spruced up and ready for some sunshine and gardening and guest visiting! LushDecor.com can help you do that easily and affordably! They have so many things for many rooms in your house to help you and your home feel fresh and ready for the spring thaw! I was so excited to see all the fantastic options they have available. Check out some of the great options. Beautiful curtains to let the sunshine in! [/caption] [caption id="attachment_9369" align="alignright"
Don't forget your bathroom with this sunny shower curtain. How beautiful would this be for the new season!? They have things for almost every room in your house whether you need new kitchen curtains or bedspreads for the kids room. I just love so many of the things that they have I had a hard time deciding what to have them send me for review. I could do so many things in so many different areas. 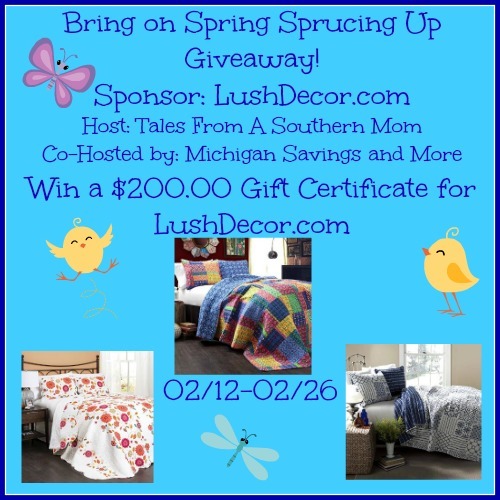 The fabulous folks over at LushDecor.com are giving away a $200 gift card for you to shop for your favorites to spruce up your home for the spring season. Enter below and Good Luck! 1 reader will win a $200 LushDecor.com Gift Card. This is open to the U.S. only. This Sweepstakes will end on 2/26/2014 at 11:59 pm. All entries will be verified. Winner will be notified by email and have 24 hours to respond or another will be chosen. Please contact julie.talesfromasouthernmom@gmail.com should you have any questions. Must be 18+ to enter. Void where prohibited by law. Full terms and conditions are in the entry form below. Top Notch Material received no compensation for this post.